Caitlin Adams, a member of Towson’s cross country team, is preparing to run 305 miles across the state of Maryland. She’s running to raise money for Limbs for Life, an organization that provides prosthetics to those in need. She is fundraising for the run via her website, www.runacrossmaryland.com. This is the full five-part series on Caitlin’s preparation for the run, which begins May 23. The Weather Channel said 42 degrees, but it felt much colder with the wind chill. And the mid-March piles of snow gave a sense of early February. But there was Caitlin Adams, walking out of Towson University’s Tower B in grey-and-pink Under Armour shorts as students in jeans and sweatpants walked past. Adams smiled despite the near-freezing conditions. It was 8 a.m. on a Thursday when a photographer met her outside the residence and began to take pictures. The photographer asked Adams to do a few practice jogs in a parking lot to make sure she didn’t get hit by a car, and that the photo was credible. “My grandma would be yelling at me, telling me I’m going to catch pneumonia,” Adams said, laughing. Adams was ready to run after the 10-minute photoshoot finished. Her neon pink shoes hit the cement pavement and she was off. She started climbing York Road and began thinking about the hills in Cumberland. Then, she turned onto Allegany Avenue, her favorite street in Towson. “It’s such a cute place. That’s why I love running up here,” she said. Adams continued through a few side streets until she got back to campus. After racing up another hill on Osler Drive, she finished where she started, 2.5 miles and an hour later. “That was super easy,” she said later. Adams, a member of Towson’s cross country team, was used to running long distances, from 10-12 miles a day. In fact, she ran again that day. However, the media attention as part of her day is fairly new. Adams will repeat this routine daily in preparation for her 305-mile run across Maryland. She’ll begin in Cumberland on May 23 and finish in Ocean City four weeks later. She’s trying to raise as much money as possible for Limbs for Life, an organization created to give prosthetics to those that can’t afford them. She ran with ease, but this will be a different test. She swore there was no rhyme or reason to it. She thinks it was an act of God. The word “prosthetics” filled Adams’ mind in her junior year at Colonel Richardson High School in 2012. She couldn’t shake the thought, so she downloaded the Dictionary.com app on her iPod Touch to find out what “prosthetics” meant. She wasn’t sure what to do with this information until the spring of 2013. After quitting the softball team (Adams said they picked favorites), she decided to try out for the track team. Running wasn’t her specialty just a few years back, when she ran a 14-minute mile in middle school. She decided she didn’t want to be last anymore and cut that time in half in high school. That’s when “prosthetics” came back to her. As early as 2013, Adams began mapping the route for a hypothetical cross-Maryland run. However, track forced her to invest more time in improving, and the run took a mental backseat. That year, she transferred from Colonel Richardson to North Caroline to help improve her times. She broke five school records and emerged as a leader, a role she loved. It wasn’t until she came to Towson in the fall of 2014 to join the cross country team that “the run” surfaced again. Caitlin sat on her dorm room floor on the second floor of Tower B soon after, and wrote down a bucket list in her journal. On it was the run across Maryland. “That was the day I was like, ‘That’s it. I’m going to do this,’” she said. Adams reached out to Limbs for Life just before Thanksgiving. She had found her purpose again. Lester Sabolich began his own prosthetic clinic in Oklahoma City in 1947. He just wanted to influence the lives of others. He had no clue how he’d change prosthetics and how his last name would become as important as any in the field. Lester’s son, John Sabolich, watched as his father designed prostheses for those in need and was inspired. It didn’t take long for John to want to join in his father’s business. After attending New York University and becoming a certified prosthetist-orthotist, John made it his mission to build the family business. He work alongside his father until he retired, then took over the business in the 1980s. However, John wasn’t satisfied. He couldn’t stand to turn away patients in need of prosthetics that didn’t have health insurance to pay for them. His son, Scott Sabolich, grew up watching these patients walk out of the clinic. John began the American Amputee Foundation with his own money, trying to find another way. He wanted to use donation money to help his patients that had little or no health insurance. In 1995, John turned the AAF into Limbs for Life, another non-profit based solely on donations. That same year, Scott got his certification. He wanted to follow in his father’s footsteps. Limbs for Life, from its beginning, worked with local prosthetic clinics to lower the price of prostheses for patients. These prostheses cost upwards of $10,000, and Limbs for Life brought the price down to $2,500 for a below-knee limb and $3,500 for an above-knee limb. Scott established his own prosthetic business in Oklahoma City in 1999. It worked in the community and alongside Limbs for Life to provide cheap options for prostheses. Since then, John and Scott have worked to help as many patients as possible. Scott even made prostheses, including 10 last year, for free just to assist a few more people. Limbs for Life, a non-profit from Oklahoma, has now served patients from 31 different states and six countries. It’s something that Limbs for Life Director of Development Shelley Dutton attributes to John Sabolich. “[The organization] has grown considerably and his vision from 20 years ago has really evolved to help hundreds and hundreds of people,” Dutton said. Today, around 3,000 amputations occur each week. The demand for prostheses is growing and Limbs for Life can only service 30-60 patients each year. However, the stories of those of whom Limbs for Life has helped keep Scott going. For the Sabolich family, prosthetics is more than a science. It’s a way of life. Caitlin Adam’s fundraising efforts were just starting in February, but she was already aiming high. She decided to write to the first lady, Michelle Obama. She told her about the run. She told her about Limbs for Life and the lives that it helped. A little over a month later, Caitlin got a response. She got an email March 12 letting her know a letter would be coming from Ms. Obama. Caitlin was on spring break in South Carolina when the letter arrived in the mail at home. Her mother, Gina, couldn’t wait to open, so Caitlin gave her the OK. When her mother called to tell her what the letter said, Caitlin could sense something was off. Obama praised Caitlin for what she was doing, but stopped short of offering physical help or money. It wasn’t enough, Caitlin said. To those around Caitlin, her reaction comes as no surprise. Caitlin’s mom began to notice her daughter’s drive as early as in fifth grade. Caitlin made purses for fun and brought them to school to show her friends. 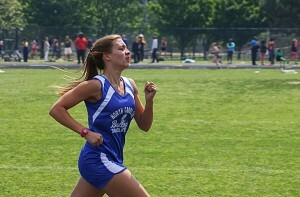 This determination carried over into middle and high school, where her desire to run faster kept her going. That hard work led Caitlin to joining Towson’s cross country team in the fall of 2014. However, her times did not improve like she thought they might while competing in the fall season. It was a difficult few weeks for Caitlin, so she decided to make a change. She left the cross country team and began planning the run across Maryland. It was another change, but one she felt was necessary. Her teammates saw her frustration, but some knew she’d still be successful without cross country. “It” could be what drove Caitlin to sell purses in elementary, cut her mile time in half and write to Michelle Obama and still not be satisfied. “It” could be why she will write the first lady again. She said she didn’t want just the letter, she wanted action. For the past three years, Angie Lange just wanted to feel normal. Ever since she headed out onto Lake Hamilton in Hot Springs, Arkansas one day in August 2011, Lange’s life had been a struggle. Lange, 48, can vividly remember the day that changed her life. She and her friend went boating on the lake with her friend’s children. The children were playing on a tree swing and Lange decided to join. However, when she swung, her wet hands slipped off the rope and she flew 10 feet to the water, fracturing her ankle. Angie’s open wound sat in the bacteria-filled water for 20 minutes until the ambulance came. She was rushed to the hospital, where she underwent four surgeries in a matter of days to fix the fracture and clean out the bacteria. The prognosis was good, but Lange continued to feel pain after being released from the hospital. Four days passed and she went back to emergency by her son Billy’s advice. There, she found out that the bacteria could not be stopped. Doctors recommended an amputation of the left leg and Lange knew it had to be done. They amputated her leg below the knee. After a few weeks, Lange was fitted for temporary prostheses, but they caused her more pain than she had hoped. Without insurance enough to pay for better prostheses, she signed up for the Limbs for Life registry of hundreds in March of 2014. She called Limbs for Life every week. 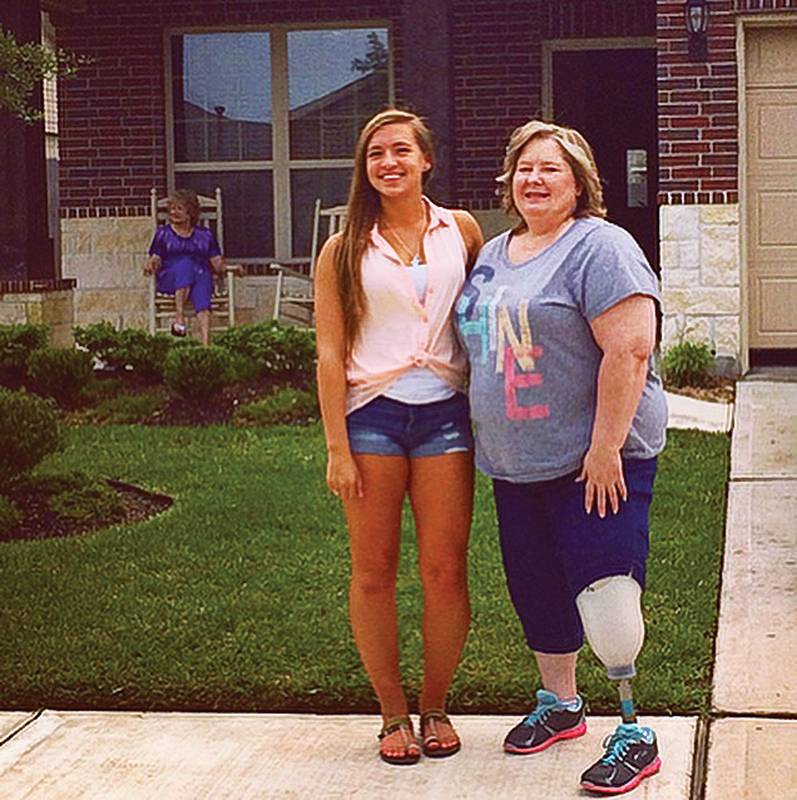 She was hoping to move up on the list of amputees waiting for prostheses. Over the course of three years, Lange’s knees began deteriorating and she was diagnosed with Post Traumatic Stress Disorder. She needed a boost. This March, she got that boost. Limbs for Life called to tell her she was at the top of list and was going to get a prosthetic leg. It took three long weeks but Lange had her new leg. She knew exactly what to do next. It was a small task, but a huge feat. A $2,500 donation from Adams allowed Lange to get her new limb. Limbs for Life reached out to Lange in March and told her that Adams’ only wish was to speak with someone of whom the money was helping. She happily agreed. The two met April 23 in Conroe, Texas, Lange’s hometown. Adams’ wish came true, and so did Lange’s. There’s not much in Preston, Maryland, the town Adams calls home. Farms fill the outskirts and empty back roads that lead to the only restaurant in the Eastern Shore town. Still, almost 50 people came out to Colonel Richardson High School, where Caitlin spent three years, on a warm and sunny Saturday morning. They came to support a “Mud-run” to help raise money for Caitlin and her run. Adams’ “mud run” started at Colonel Richardson High School in Preston, Maryland. Adams and her mother stood in a field of dandelions in front of the fence that surrounded the track as participants signed up for the run. The memories started to return. “I went through a lot of pain on that track,” Adams said. “That’s where it all started,” her mother said. The group, anxious to start the run, huddled in a circle around Mr. Shelley and Adams. She thanked everyone for coming and she began sending runners out in pairs. While the runners were making their way through the course, which entered the woods and popped back out, Caitlin and Gina Adams started thinking about the run again. With a month to go, Gina said she was confident in her daughter. It didn’t take long for Adams to begin thinking about what’s next. She said she wants to run across America. “Why not? There’s only a couple people who’ve ever done it,” she said, in true form. “You could,” her mother answered. She hasn’t started her run yet, but Adams is already looking for her next challenge.